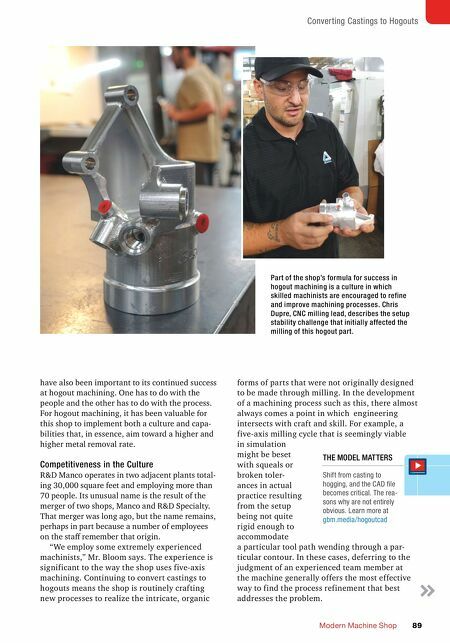 SHOP EFFICIENCY MMS JANUARY 2018 88 mmsonline.com Five-axis machining is the most important capability for realizing this success, say John Bloom, president of R&D Manco, and Kevin Beach, general manager. That much is probably obvious. The complex forms that are no longer cast have to be realized instead through elabo- rate contour milling. However, there are other important aspects of thriving at machining hogouts that relate to the increased importance that any shop takes on when it agrees to do this work. The shop doing hogouts is agreeing to more than just heavier mill- ing. By bypassing the foundry, it is consolidating the customer's supply chain and bringing more of that supply chain into its own operation. The shop is taking on a dramatically larger role in determin- ing the ultimate cost and delivery of the part. It is accepting the entirety of any pressure for future cost and lead-time reductions. In short, the shop doing hogouts is stepping up to do more. 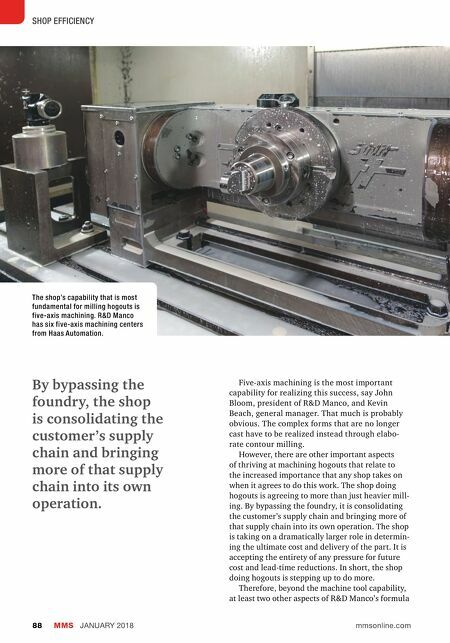 Therefore, beyond the machine tool capability, at least two other aspects of R&D Manco's formula By bypassing the foundry, the shop is consolidating the customer's supply chain and bringing more of that supply chain into its own operation. The shop's capability that is most fundamental for milling hogouts is five-axis machining. R&D Manco has six five-axis machining centers from Haas Automation.